Don't miss this spectacular series of Antarctica photos on Flickr, taken by an electronics engineer currently stationed there. I think my heart would explode if I experienced a scene like this in person. Time for another dive into the macilife.com mailbag! A reader writes: We are trying to make a slide show for our daughter's wedding reception, with e.g., side-by-side baby pictures of bride and groom, along with explanatory text. We tried doing this in PowerPoint, but when exported as a QuickTime Movie and imported into iMovie, the pictures and text got all fuzzy. 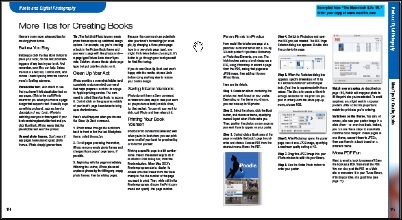 Is there some way to do it as an iPhoto Book, making use of all of the nice layout and text features, but convert it to a slideshow? There is! You can create book pages in iPhoto 5, and then use some PDF tricks to extract pages and include them in iPhoto slide shows or in iMovie or iDVD projects. You'll find details on page 175 of my book. But it wouldn't be right to leave you hanging, so I've extracted that particular two-page spread and posted it as an excerpt. Download it now (300K PDF). Once you perform the steps in this excerpt, you'll have an image of a book page in your iPhoto library. From there, you can use it in an iPhoto slide show or send it to iMovie HD or iDVD. You can also order photographic prints�even poster-sized ones�of your book pages. It's all in the excerpt, so grab it and enjoy. Later in the book, I talk more about using iPhoto book pages in iDVD slide shows. But hey, I can't give away the entire store. I'll let Amazon do that, as described below. Best price yet on Amazon. I was perusing my book's page on Amazon.com�a task most authors perform at least 37 times a day�and lo! Amazon has lowered the price to $20.99. That's forty percent off the $34.99 cover price, and a pretty good deal for a full-color, 345-page book that also includes a two-hour, 43-minute instructional DVD. Learn more about the book and DVD, watch some DVD excerpts, and then order your copy�before Amazon raises the price again. A friend writes with a question: I have created a movie (a little over an hour in iMovie) and have sent it to iDVD. There is no problem with the encoding of the movie�until iDVD attempts to encode the audio soundtrack. I have NOT included any additional audio tracks in the project�just the ambient sound from the movie. The iDVD program quits (the "burn" wheel stops spinning at that point), and ultimately I have to "force quit." Any suggestions? Well, the good news is, you aren't alone. The bad news is, there doesn't seem to be any definitive answer for this problem. I poked around on Apple's iDVD discussion boards and came across this series of posts describing exactly the same problem. And the possible fixes are all over the map. Other users blame flakey memory chips, and report success after yanking non-Apple RAM from their Macs. Other users just sit and weep quietly. Also look into whether your original video was shot with your camera in 12-bit audio mode. (Never a good idea�always use 16-bit mode.) Try saving your DVD as a disc image instead of burning directly from iDVD. (See page 280 of my book.) Make sure you have at least 20GB free on your hard drive. And have some tissues nearby to daub away the tears. When it comes to reliable encoding and burning, iDVD 5 is a big improvement over its predecessors. But it's clear there's still room for improvement. Here's something that will help you have a nice, productive Monday. From Flagrant Disregard comes the magazine cover creator: choose a public photo on Flickr, type some text, and you're done. Previous coverage of Flagrant Disregard's Flickr toys: the mosaic maker and the badge maker. A friend points me to this photo. Okay, so sometimes my marketing efforts take longer than they should. I've been wanting to post some QuickTime movie excerpts from the instructional DVD that accompanies The Macintosh iLife '05, but it's taken me a while to get around to the grunt work involved in doing so: extracting the video clips from Final Cut Pro, compressing them, uploading them, building links. I finally got my act together, and am happy to present upwards of 20 minutes of excerpts from my book's two hour, 43-minute DVD. You'll find tips for the iPod, instructions for doing levels adjustments in iPhoto, tips for using iPhoto 5's Calendar pane, a look at iMovie HD's Magic iMovie feature, tips for working with GarageBand 2's pitch-correction feature, and more. Check them out and read more about the Milky Way's top-selling iLife book: 345 beautiful full-color pages and nearly three hours of video instruction. Then consider ordering your own copy of The Macintosh iLife. It's only $23.09 on Amazon�34 percent off the cover price. Flickr, the dazzling photo sharing site that is occupying more and more of my time, is on the verge of adding the ability to order prints and photo books. This news comes from a set of oh-so-obvious leaks from Flickr itself. Earlier this month, Flickr's Eric Costello spilled the beans in a fascinating interview: "With most of the other photo sharing sites, they seem to be mainly about facilitating the ordering of prints. Which is a fine goal, and soon enough in Flickr you�ll be able to order prints, which is a much-requested feature from our users." Then, just a few days ago, Derek Powazek wrote about receiving some "very special surprises" in the mail: a mosaic print (not unlike the Tiger mosaic project I presented last month) and an 8 by 10-inch photo book. Powazek has posted more photos of the book on Flickr, and while the cover is lovely, the interior design is staid and bland. Let's hope the final books provide some more design sparkle. (See also Apple's iPhoto books.) At the very least, those photo titles ought to be left-aligned with the photos and their captions, not centered above them. Not just mine. What I really hope is that Flickr will allow me to order books containing photos taken by other Flickr members. 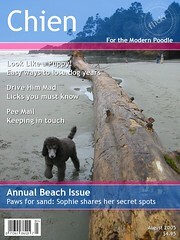 I'd love to order books from some of the photo pools I belong to�like poodles or My Dog Has an Awesome Tongue. This should be possible with photos that have the appropriate Creative Commons license. I'd also like to have the option of printing a photo's comments along with the photo. The conversation that some photos inspire is one of the magic things about Flickr, and it'd be nice to have a printed record of it. Right now, as proof that Flickr members have a tough time getting up early, "sunset" is beating "sunrise" 88401 to 16127. See more battles and try the site out for yourself. I will tell you, ahem, that "Saturn" is kicking "Uranus." Now we can all breathe again. Amazon has again restored the 34 percent discount on my book. And woot! What a lovely new reader review on Amazon: "This is an extraordinary book!! It will be at my side constantly as I learn all the intricacies of ILife '05. There are so many tips; it is written in a logical fashion, with a humorous touch. Easy to read; easy to understand; it's been invaluable for me to learn all the intricacies of iLife�which you would NEVER discover on your own!" Don't have it? Order it! Have it? Order one for a friend! But lest you get the idea that this site exists only so that I might have a stage upon which to toot my own horn: iThemez has announced a new family of themes for iDVD, and the first batch is free, free, free. The first two themes are Independence Day (flag, USA map) and Slot Machine (one-armed bandit whose wheels�what are those fruit-painted rotating parts called, anyway?�are drop zones). Patriotism and gambling: something tells me Bill Bennett is going to love this company. Anyway, the themes are cute and worth checking out. No, not Bill Bennett. My big brother Bill Heid celebrates a birthday today. Show him some love and explore his critically acclaimed library of jazz and blues CDs. This guy can play. The good folks at Peachpit Press tell me they're working on it. In the meantime, if you're looking for the best price on the best iLife book, you have a few options. Barnes & Noble. BN is selling the book for $25.19, more than 20 percent off the cover price. Order here. Amazon marketplace merchants. Numerous Amazon merchants are selling brand-new copies at prices as low as $22.21. Explore them here. Peachpit Press. If you become a member of Peachpit Press, you can buy the book for $24.49. Check it out. My thanks to the readers who emailed me about Amazon's lastest blunder. Rest assured the problem is being looked at by the best and brightest minds at NASA. I just came across this photo on Flickr. When I grow up, I want a setup like this. 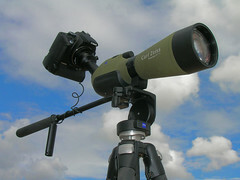 Check out sparkyfaisca's spectacular bird photography. Over at Macworld.com, my colleague Chris Breen shares a tip I've always liked: setting the start time and/or stop time of a song using the track information window in iTunes. As I say on page 67 of my book, this is a great technique for "cropping" out unwanted portions of a song: the long and rambling introduction at the beginning, or the ear-bleeding glockenspiel solo at the end. 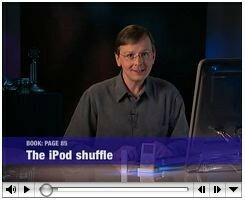 And as Chris points out in his tip's forum thread, iTunes transfers your custom start/stop time to the iPod. A faster way. Ah, but there's a faster alternative to journeying into the song information window and manually typing start and stop times. Just use a free AppleScript from Doug Adams. Specifically, grab the script named Player Position to Start or Stop v1.1. After you've installed the script, you can adjust a song's start or stop time in a flash. Just play the song until that long, rambling intro ends, then stop playback and choose the script's name from your Scripts menu. Simply click Start Time or Stop Time as desired, and you're done. Chalk up another one for automation. Want more scripts? For the latest edition of my book, Doug kindly compiled an exclusive collection of AppleScripts for iTunes. They're on the DVD-ROM portion of my book's DVD, along with iDVD themes, video clips, and more. 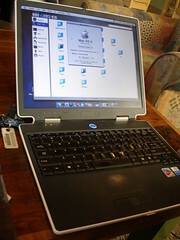 It's all part of the world's best-selling iLife book: 345 full-color pages and a two-hour, 43-minute DVD. Learn more, then order The Macintosh iLife '05 for just $23.09�34 percent off the cover price. If you're a frequent visitor to this space, you know that updates have been a bit lean of late. Apologies: a busy schedule and life's unexpected adventures have had me hopping lately. Here to take you into your weekend are a few miscellaneous odds and ends. The Mighty Mouse and the Macintel angle. Macworld's review of Apple's Mighty Mouse is online. It looks like a swell little rodent, though I agree with reviewer Jennifer Berger's assertion that squeezing the mouse could lead to repetitive-stress injury problems. But here's the greater question: Why has Apple finally come out with a multibutton mouse? One reason might be that many users have been screaming for one for years. But I suspect next year's Macintel (that is, Intel-based) Macs represent another reason. Think about it: We'll have Macs that will be able to run Windows natively. People who do run Windows on Macintel machines are going to want to right-click. The Mighty Mouse will let them. I'll bet you a graphics tablet�an input device superior to any mouse, in my overworked wrist's opinion�that Macintel Macs will ship with Mighty Mice. Or Mighty Mouses. Or whatever the correct plural is. And it's good to see Viacom International getting a few bucks out of the "Mighty Mouse" moniker, isn't it? Dealing with multiple iTunes libraries. No one makes iTunes sing like Playlist's Chris Breen, and he recently wrote about a thorny problem: merging a couple of iTunes music libraries. Great stuff. Photography: digital really is sharper than film. On his always-splendid site, photographer and master imager Michael Reichmann writes about the sharpness of digital imaging versus film. Now on Flickr: Interestingness and clusters. The photo fiends at Flickr have introduced a couple of new features for exploring the deepening ocean of images on my favorite photo sharing site. You can also get a list of your most interesting photos; here's mine. Read about the new features on Flickr's blog, and marvel at the talent of these kids. Department of circular reasoning. Finally, check out this message from the Adobe Updater, part of Adobe's Creative Suite 2. To have a good weekend, be sure to have a good weekend! I'm hosting another edition of Point and Click Radio radio tonight on our local public radio station, and it's going to be an interesting show. I'll start off with a round-up of the week's news, including a segment on Apple's new Mighty Mouse (which Macworld likes and PC World isn't so fond of). In our second half hour, we'll talk electronic activism. This month marks the fifteenth anniversary of the Electronic Frontier Foundation, which has been involved in everything from privacy issues to the much-despised Digital Millennium Copyright Act. My guest will be Derek Slater. He's an activist intern with the EFF and a fellow at the Harvard Law School-based Berkman Center for Internet and Society. He's also a self-described copyfighter, working to flesh out the "the future of copyright with respect to the Internet and digital media." Point and Click Radio airs at 7 pm Pacific time on KZYX and KZYZ. We also webcast live via RealAudio; you can tune in by visiting the Listen Now page. And if you can't bear the RealPlayer or won't be awake at 7 pm Pacific, fret not. A downloadable MP3 archive of the show will be available by the end of the week. Last Saturday, there was a zombie flash mob in San Francisco (ah, youth! 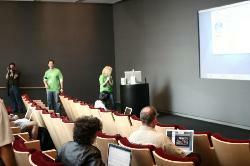 ), and the zombies made their way to the Apple Store�where they found her (lower left, foreground). Another correspondent sent me a photo showing her in the store on Tuesday, July 26. There's a Flickr photoblogger get-together at the Apple Store tonight. Will she be there? I bet we'll find out. macilife.com: Apple news you can't really use but like anyway.